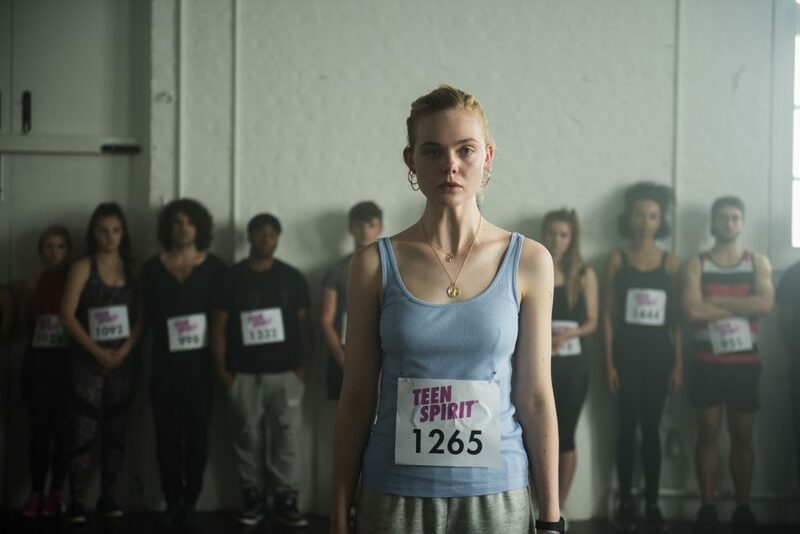 "Teen Spirit" star Elle Fanning on transforming into a pop star: "She’s not the most likable. I really enjoyed that about her"
Ahead of the film’s April 12th release, I met with Fanning to discuss her not-so-surprising A Star is Born moment. While Teen Spirit may be her first stint in a pop musical, the Maleficent actress is actually no stranger to the world of music. In 2016, she performed a rousing duet with French musician Woodkid (real name Yoann Lemoine) at the Montreux Jazz Festival. “I don’t even know if Yoann knew I could sing,” she told me of the performance. “It was something like, ‘Hey, do you want to do this little thing with me?’ Then it turned out to be a huge, beautiful festival.” Fast forward to the casting of Teen Spirit, and Fanning’s performance of “Never Let You Down” at the festival became the basis of her audition. During our talk, Fanning also discussed transforming into a pop star in the span of three months, channeling Kanye West in the film’s final performance, and attending a BTS concert. Read more from our interview below. HelloGiggles: How long have you been singing? And why were you particularly interested in taking on a musical? 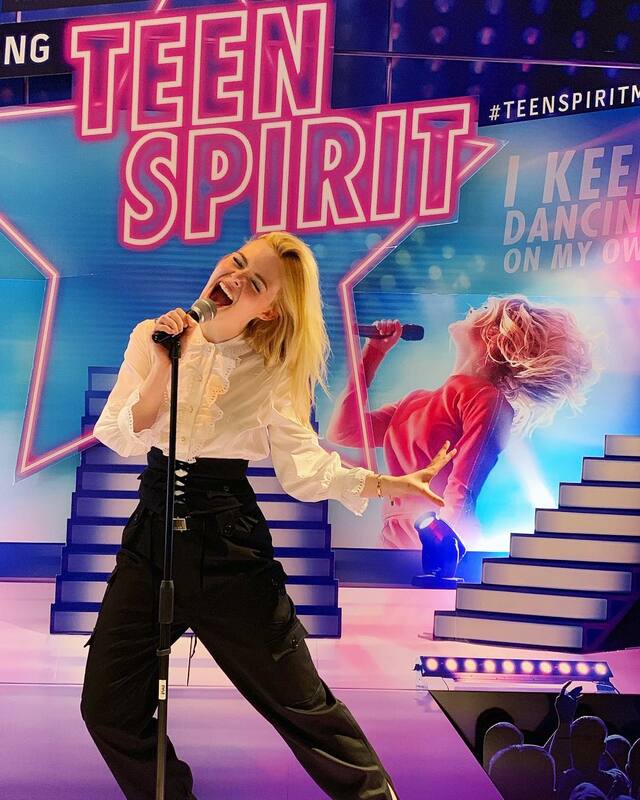 Elle Fanning: Singing has been a secret passion of mine ever since I was young. Since I started acting, a musical was always on my bucket list, and being able to show off and get to work on that part of myself. Because this, obviously, it involved a lot of training. Even if you can hold a tune, it’s different getting yourself ready for these live performances. Singing was just always in my blood and I just knew maybe one day I’ll get a musical. They were not looking at me for this part [of Violet], so I had to prove myself. They were looking at girls mainly in Poland who are unknown and singers. I sent that clip of Woodkid and I, which was also my first time performing in something that huge. Yoann, he’s a friend of mine, and it was interesting how that came about. But I’m very thankful because he’s part of the reason I got this part. I got to send that clip. They realized, “Oh, she can sing.” Of course I knew there was so much work ahead, and Marius de Vries, he was the music supervisor and my mentor throughout the whole film much like Vlad’s [Zlatko Buric] character. We worked for three months, and we would sing all the songs all the way through except for the last song [Sigrid’s “Don’t Kill My Vibe”], which we did not pick until way later. I was nervous, but I like putting myself under pressure. I thrive when I’m the most scared. HG: What was the most challenging part of bringing this character to life? EF: I think it was the accent and choreography and singing. There were a lot of elements other than just playing a character. I think the most challenging was gauging her as a performer, because she’s not a performer. She performs in this grimy pub. She has a good voice [and that] potential, but she’s not a true performer yet. She’s not used to that. We don’t film the film in chronological order so it’s like, sometimes you have to hold back and hold back and hold back until the final one. HG: I know you studied Katy Perry and Taylor Swift clips for the role, but who are some of your favorite artists at the moment? EF: I love Mitski. I love her. At the moment, she is my one person. Mostly for this [role], I was watching pop stars that Violet would be listening to, like Gwen Stefani. And Dua Lipa is someone that I felt was very similar to Violet. They [both] come from a small town in England. “New Rules” had just come out while we were filming, so it was playing constantly. HG: What kind of research or inspiration informed your choreography? EF: There were definitely choreographed sequences, like the try-out sequence and the group performance [toward the end], but dancing in my bedroom, Max was like, “Just dance like you would dance.” That’s really me just feeling the music and dancing in the way that I felt Violet needed to. In the last performance, she has a hip hop kind of vibe. Maybe like a little Rihanna. I would say a Kanye West vibe. In his shows, the colors, the imagery was reminding me a bit of that. I think the performance for Violet is also an outcry. She’s not really performing for anyone. She’s performing for herself, and she needs it for herself. It’s quite [an] angry performance. I was thinking mostly about the need for this, and how it’s [this] adrenaline of energy and stomping anger. It’s like a rebellion. “This is me and this is it.” She gets to be herself and the artist that she eventually would become. I didn’t necessarily try to emulate anyone in that. EF: Yes! I went to the BTS concert. HG: Shut up. That’s amazing. I want to unpack that so much. HG: With K-Pop entering the mainstream, and Latin artists dominating the airwaves, what do you think it is about the pop genre that’s so universal? EF: Growing up, [in] high school, it was like, you weren’t cool if you didn’t know the latest pop song, you know? Pop music is something I’ve listened to ever since I was little. I would listen to Fergie and the Pussycat Dolls. It’s something that’s just universal. It makes you feel good but also, the artists that rise to the top are the ones you feel something from it. It’s authentic. Like Ariana Grande’s new album. It’s like, she didn’t have to put that out there. But she just dropped it because she felt like it. Fans can see when you’re being yourself. This interview has been edited and condensed. Teen Spirit arrives in theaters on April 12th.